It’s that time again! What wonders does Nell Peters have to share with us this month? Grab that cuppa and get cosy! 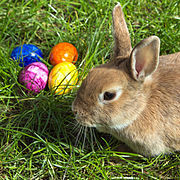 Morning all – and happy Easter Eve, on the ninetieth day of the year! I was going to say Easter Saturday, but apparently that’s the one that follows Easter Sunday. Not a lot of people know that, or maybe it’s just me. I don’t imagine too many folk will be around today, so who shall we be rude about? Perish the thought … although a few candidates spring to mind. Anyone heard of the Bangorian Controversy? I confess I hadn’t. 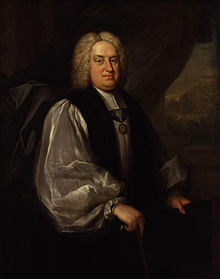 It all began when the Bishop of Bangor, one Benjamin Hoadly, delivered a sermon on 31st March 1717 to King George I. His focus was The Nature of the Kingdom of Christ, taken from John 18:36; ‘My kingdom is not of this world’. Hoadly’s interpretation was that there’s no justification in the scriptures for church government in any form, because Christ did not delegate His authority to any representatives. There are a few church bods who should perhaps take note? Whatever, obviously this was a pretty contentious viewpoint, hence the controversy bit – one of the main objectors being a chap called Thomas Sherlock (Dean of Chichester), whose name naturally appealed to my pathetic sense of humour. The Bangor in question is the one in Wales, as opposed to County Down, Northern Ireland, which is why the item attracted my attention in the first place. If I had a quid for every time I’d passed through the station there, I could buy you all a slice of Welsh rarebit. This was while sons #1 and 2 were boarders at Indefatigable School, Bangor being the nearest train stop to the school’s location in Llanfairpwllgwyngyllgogerychwyrndrobwllllantysiliogogogoch, although there is still a disused station there where tourists pose for pics in front of the sign. 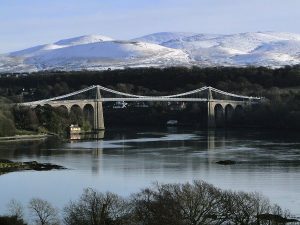 From Bangor it was a taxi ride over the Menai Suspension Bridge (Thomas Telford, 1826) to Anglesey and the seat of learning, housed in what used to be the Marquis of Anglesey’s sprawling estate. All very beautiful in the summer, but slightly grim during winter months. Llanfair PG (local shorthand) translates as ‘Saint Mary’s Church in the hollow of the white hazel near a rapid whirlpool and the Church of St. Tysilio of the red cave’. Fancy that. The one hundred and forty-two pupil establishment was run strictly in the naval tradition, with all boys and some staff wearing appropriate uniforms, and areas of the school referred to in nautical terms – most obviously the kitchens as the galley. All this was in homage to the original school being aboard a ship called Indefatigable, moored on the Mersey in Liverpool from 1864. In those days the ethos was to offer poor boys a home and education to equip them for a life in the Merchant Navy. Incidentally, it was on this day in 1972 that the rum ration in the Royal Canadian Navy was discontinued, and in the UK the official Beatles fan club (if I mention Yellow Submarine that’s a link to the sea-faring theme, right?) was closed – just thought I’d toss in those facts for good measure. Where was I, ah yes – dry land Indefatigable sleeping quarters were called dorms (as opposed to cabins or similar) and there was a nocturnal fire in Raleigh House during #1’s residence. Try as he might, the Housemaster couldn’t rouse the boy as flames licked around ancient timbers, and ended up physically dragging him from his bunk (no hammocks!) Miraculously, no one was hurt and damage was contained. Said heroic Housemaster, Chris Holliday, was Head of English; he is now retired and enjoying a comparatively stress-free life in northern France with his dog, Einstein – we chat every now and again on FB. Chris and I that is, Einstein being more into Snapchat. With grounds stretching down to the shores of the Menai Strait (Afon Menai), water sports and seamanship skills featured strongly in the curriculum, along with more mundane academic subjects. While #1 did well, became deputy head boy and left with a slew of impressive results en route for uni, #2 decided to buck the system and rebel. His biggest claim to fame – definitely one of his less bright ideas – was to lead a bid for freedom at the dead of night. Picture several thirteen year-old boys on foot traipsing down narrow, largely unlit, winding country lanes and over the bridge to Bangor, in a haphazard crocodile formation; those tiny roads are scary enough driving in daylight! When the intrepid ones reached Boots’ car park, inspiration deserted them and eventually a member of the public alerted the school – presumably, one of the lads was daft enough to wear part of the school uniform for ease of identification. The Great Escape that never was; I think I prefer the Steve McQueen version. Coincidentally, some years before the sons’ time at the school, Super Blogger Anne Williams was studying at Bangor Grammar School for Girls, whose pupils used to be invited to Indefatigable school discos to trip the light fantastic with the older boys. What a weeny world this is, forsooth. The school is now occupied by the MoD, after it closed unexpectedly during the summer of the year we moved from London to Norfolk – and so after hasty negotiations, #2 went from being a pupil living several hour’s travel and hundreds of miles away from his school, to literally being over the road. #3 was home for ten days at the beginning of March, catching up with his boss at the company’s UK base, as he does every now and again. 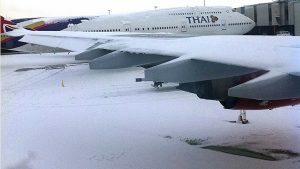 He flew out of Bangkok in temperatures of 34 degrees C and landed at Heathrow early next morning in -1C and snow – nine minutes early after a thirteen hour flight. Not too shabby, although he was with Thai Air and it was a dry flight because of Buddhist’s Day – something he learned to his horror only when he checked in and went off in search of his customary pre-flight pint of Guinness. From Heathrow, he then had a three hour drive back to Norfolk in scary conditions. The same day, a friend’s son flew from Germany to Heathrow en route for Edinburgh and his stag do. Alas, the guys were all stranded in London. Seriously? Air Canada pilots regularly land on six feet of solid ice! While home, #3 did the usual rounds of brothers, plus nieces and nephews in his capacity as everyone’s favourite uncle – he spoils them rotten and lets them get away with murder. #4 had moved house since his big brother was last home and so received much gratis advice on interior redecoration; I didn’t notice anything as practical or exhausting as a paintbrush being wielded, though. 11th March was Mother’s Day in the UK and as has become a tradition, #4 arranged (for want of a better word!) my flowers in a lime green plastic jug thingy from Ikea, that the OH bought many years ago because he thought I’d like the shape. Shape is OK – hate the colour. When #4 was thirteen, he got his first pay packet from his paper round the day before MD, raided Tesco on his way home and put the flowers he’d bought into the Ikea jug. It was the first thing he saw as he charged through the kitchen en route for his room – where the flowers remained overnight, with his window wide open so they remained fresh. As if this house isn’t cold enough! 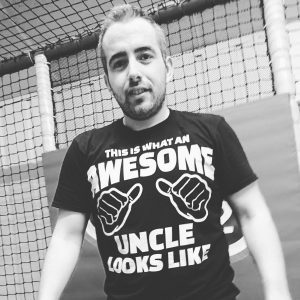 Our nomad (he’s getting far too much publicity in this blog!) flew back to Bangkok on 11/3, leaving at crazy o’clock in the morning. So, my celebration actually stretched from Friday night dinner, through Saturday lunch and on into Sunday, with various sons and their families appearing whenever they could, combining MD with saying adios to their brother. It was a brilliant weekend! 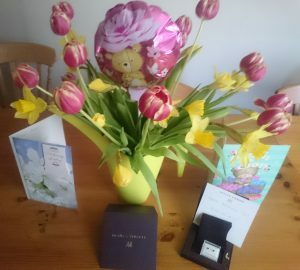 Because he isn’t home for Easter (holiday in Sri Lanka, if you please!) I have had to warn him that the bunny may not have enough petrol in the Eggmobile to deliver his chocs. However, the annual Easter Egg Hunt will take place here, the Grands searching for spoils in what GD #2 refers to as ‘the dark forest’ – in reality a rather more mundane area of perhaps fifteen tall trees. The Grand National has been run several times on 31st March, starting in 1905 (the 67th race) when it was won by Frank Mason riding Kirkland. The 116th race in 1962 was won by Fred Winter on Kilmore; 127th by Brian Fletcher on Red Rum in 1973; 133rd by Maurice Barnes on Rubstic in 1979, and in 1984 the 138th race was won by Neale Doughty on Hallo Dandy. 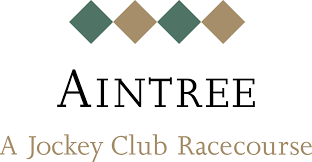 Since 1839 the Grand National – a National Hunt horse race – has been run annually at Aintree Racecourse in Liverpool, with the exception of war years 1916-18 and 1941-45, when the land was requisitioned for military use. It is a handicap steeplechase run over 6.907 km with horses jumping 30 fences over two laps and is the most valuable jump race in Europe, with a prize fund of £1 million in 2017 – note to self: learn how to ride a horse, although at 5’9” I may be a little tall to be a jockey. I know nothing about horse racing, but even I’ve heard of Red Rum (and Shergar, who disappeared in February, 1983! 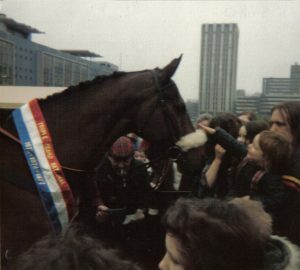 ), the horse that holds the record number of Grand National wins – in 1973, 1974 and 1977, coming second in 1975 and 1976. Plus for sixteen years he held the record for completing the course in the fastest time of 9 minutes and 1.9 seconds. The race is notoriously difficult and has been described as ‘the ultimate test of a horse’s courage’, but Red Rum’s jumping prowess was legendary; not one tumble in a hundred races. He was retired before the 1978 National after suffering a hairline fracture the day before the race. However, he had already become a national celebrity, opening supermarkets and leading the Grand National parade for many years. He even switched on the Blackpool Illuminations in 1977 – no mean feat with cumbersome hooves, I imagine. When the horse died on 18 October 1995 (aged 30) it was announced in the national press and he was subsequently buried at the Aintree winning post, with an epitaph that reads, ‘Respect this place / this hallowed ground / a legend here / his rest has found / his feet would fly / our spirits soar / he earned our love for evermore’. 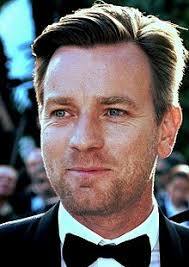 Multi award winning actor and Scot, Ewan McGregor celebrates his forty-seventh birthday today, although it may be a slightly subdued affair since he filed for divorce earlier this year after twenty-two years of marriage and four daughters, only to be unceremoniously dumped by his new love interest. Hey-ho. His film, TV and theatre credits are impressive, including Trainspotting, The Ghost Writer and Salmon Fishing in the Yemen, plus later versions of Star Wars, to name very few. His maternal uncle, Denis Lawson appeared in the original Star Wars. McGregor is heavily involved in charity work, including UNICEF, visiting some of their projects during the motor bike documentaries he made with mate Charley Boorman. 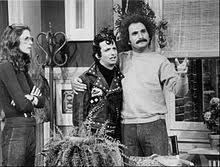 Another actor born today is American Gabriel (Gabe) Kaplan – he’s seventy-three. In Montreal, I remember watching him in an American TV series called Welcome Back Kotter – he played the eponymous role of Gabe (no chance of forgetting his character’s name) Kotter, a teacher who returned to his alma mater in New York to teach a remedial class of loafers, called Sweathogs. As a member of the original group of Sweathogs, Kotter befriended the current bunch and over time got his unruly pupils to realise their potential. The Sweathogs’ unofficial leader was Vinnie Barbarino, a cocky Italian-American, fan of Star Trek and resident heartthrob of the group. The part was played by one John Travolta (pre Saturday Night Fever and Grease etc), who was in real life a high school dropout. Our third and final thespian birthday is another American, Rhea Perlman, who is seventy. She is separated from husband Danny DeVito with whom she has two daughters and a son. At 5’0” she’d probably stand more chance than me of riding in the Grand National – and DDV is even shorter, although a tad overweight. Perlman’s career began off-Broadway in tiny parts until her first notable TV (recurring) part as Zena, the girlfriend of Louie De Palma (played by DeVito), in Taxi. But her most memorable role has to be that of wisecracking Carla Tortelli, waitress in a sitcom set in ex-baseball player Sam Malone’s Boston bar. And that’s my last word on the subject – Cheers! Thanks for having me, Jen – not too many Easter eggs, now. Huge thanks Nell- as ever. Great entertainment Anne. Enjoyed it so much, thanks.